Periodically the media treats us to stories that illustrate the power of employers to control workers’ lives in ways that may have little to do with the actual product or service they are providing. This summer I spotted a couple of stories that fall into this category. According to the complaint, he was hired as a painter in October 2017 and discovered on the job that he was required to attend Christian Bible study as part of his employment. Coleman, who is half-Native American (Cherokee and Blackfoot), wasn’t comfortable with those terms, his attorney, Corinne Schram, told NPR. “He says his church is a sweat lodge, his bible is a drum, and that’s his form of worship to the creator,” Schram said. According to the document, Coleman expressed his discomfort with attending the Bible study meetings and said the requirement was illegal, but business owner Joel Dahl insisted that he go anyway.
. . . After several months, Coleman finally refused to go to the religious sessions and was fired from the job, according to the filing. WeWork is no longer a safe space for carnivores. Earlier this month, the co-working juggernaut announced that it was essentially going vegetarian. The company will no longer serve red meat, pork or poultry at company functions, and it will not reimburse employees who want to order a hamburger during a lunch meeting. In a memo to employees announcing the new policy, Miguel McKelvey, WeWork’s co-founder and chief culture officer, said the decision was driven largely by concerns for the environment, and, to a lesser extent, animal welfare. Generally speaking, private sector employers enjoy wide leeway in setting company hiring and work policies, so long as they do not violate discrimination laws and similar protections. The Bible study requirement directly implicates an employee’s right to be free of religious discrimination by an employer. The vegetarian food order requirement, however, does not appear to run afoul of any employment laws. Legal distinctions aside, I think there’s a strong case for removing the company mandates in both situations. I respect that a business owner may want to create a company that embraces certain values. However, I also think that we need to give workers room to be themselves in their everyday choices. It’s about getting the balance right. Let me start off by admitting that managing work-life balance is not one of my strengths. I tend to get wrapped up in the various projects I’m working on, and it just so happens that I have a lot of them competing for my attention right now. I truly enjoy genuine down time, but I don’t build enough of it into my schedule. Yesterday I waved the white flag of surrender, dropped a book and some magazines into my backpack, and took the subway into downtown Boston. There I went to a Pret a Manger sandwich shop/cafe, bought some lunch, and commandeered a comfortable seat and small table for the afternoon. Pret is a chain, and I’ve noticed that each Pret store tends to adapt to its space and location in terms of look & feel. This Pret is odd in a good way. It’s in the heart of the city’s Downtown Crossing area, and it’s very busy during peak weekday hours. However, outside of those times, it feels more like a spacious, hang out-type cafe. Plus, the food and beverages are good. The book was a strategic choice: Don Winslow’s The Force, a gritty and gripping cop novel set in today’s New York City. It’s really, really, really good. Between various obligations and the overall state of the world, I’ve had trouble maintaining focus on books read purely for pleasure, but The Force is drawing me in easily. Winslow is a great storyteller who has done his homework on creating a realistic backdrop. If you like your crime/suspense novels in the cozy zone, then I’d suggest skipping this one. But if you like them with big doses of in-your-face real, then I highly recommend it. Anyway, now that I’ve done a few product endorsements (Pret and Winslow, you’re welcome), back to my point about taking an afternoon off. Being a nostalgic sort, this reminded me of days as a young Legal Aid lawyer in New York City. Money was tight, so vacations involving travel were out of the question. 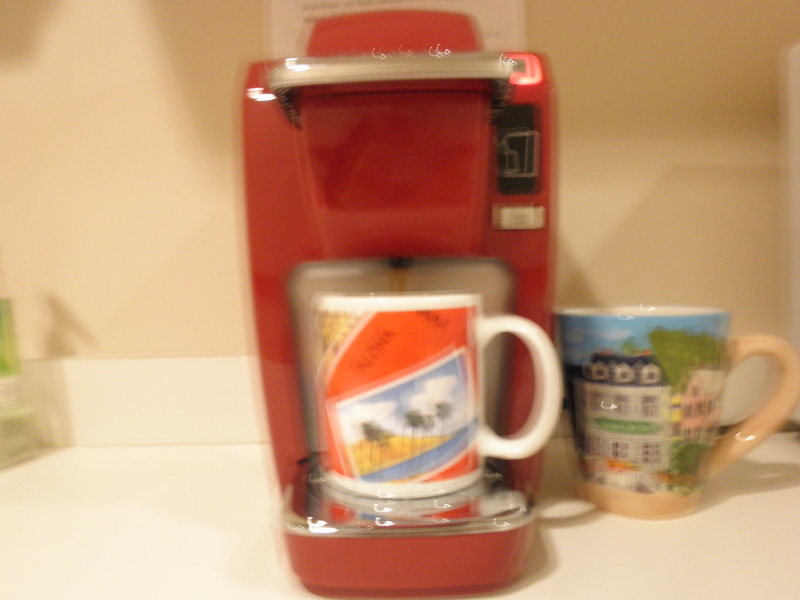 Instead, I found myself using vacation time in one and two day chunks, taking what are now called staycations. One of my favorite pastimes was to pack a few books and find a place to read them over a cheap lunch and something to drink. This made for a welcomed afternoon mini-vacation. I need to do this more often. A good book, some coffee and a morsel or two, and I’m good to go for the next time! 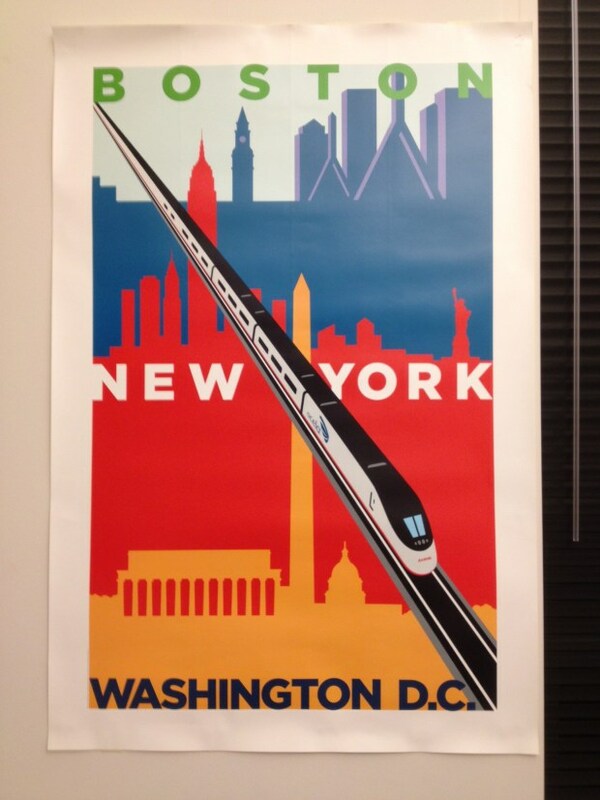 Today I’m hopping on a train to New York City (hence the Amtrak Acela poster from my office! ), the travel piece of what has become an annual Thanksgiving get together with my cousins and friends. What began over a decade ago as an impromptu turkey day gathering is now a full-fledged tradition, and I look forward to it every year. In classic New York style, we don’t start until the late afternoon. We’re all pretty hungry by the time the feast is served — and when I say feast, I mean it! The evening finishes up with many choices of desserts amidst singing and playing music. Over the years, not much has changed about this gathering, the most noticeable difference being the kids now joining the grown ups at the main table. We repeat ourselves a lot from year to year, including well-deserved compliments to the chef and updates on how we’re all doing. That suits me fine. It is a source of continuity and connection, and a blessed reminder of how friends become family, and vice versa. But for various reasons, I find myself a little down this year. I tend not to be the biggest holiday enthusiast to begin with, but I am particularly mindful right now of how many people are in need and how many are struggling with life’s challenges. I started this blog five years ago, just as the Great Recession was going into full gear. Today, here in one of the world’s richest nations, we have millions who can’t find decent jobs, even more who are dealing with hunger on a daily basis, and a wealth gap that grows ever wider. Beyond our shores and borders, the situation worsens, often by leaps and bounds. Recently I met a man around my age who is from Guinea in West Africa. He has been working in the U.S. for over 20 years. He lives on very little so he can send most of his earnings back to his family and village neighbors, who are in dire need of the most basic staples and provisions. For those of us who are in a position to be thankful for life’s bounty, the best way to show our gratitude is to give back. Whether by way of money, service, advocacy, or some combination, we have opportunities to make a difference. As the saying goes, and inspired by multiple faith traditions, from those to whom much is given, much is expected, yes? 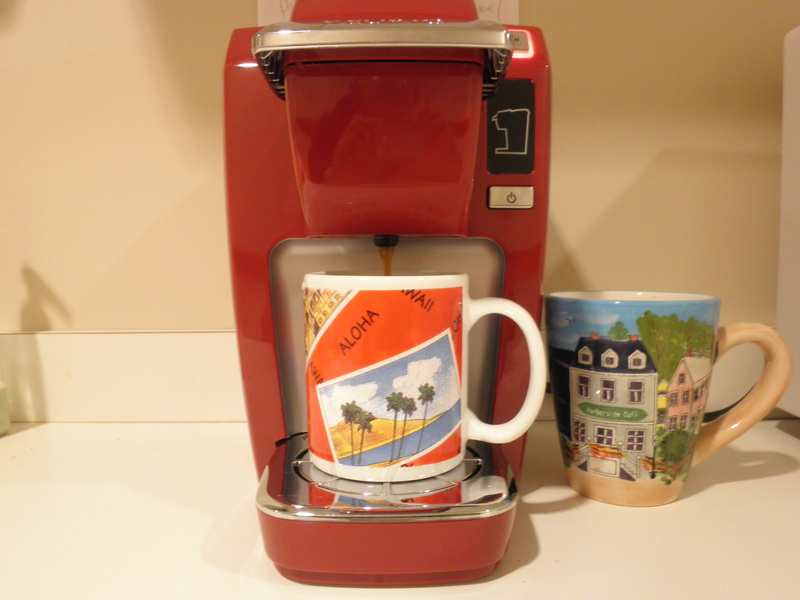 Periodically I like to justify my coffee habit by writing about the vital brew, and this Monday morning seems as good a time as any to share some musings. However, observes Robertson, Southern troops rarely had adequate supplies of coffee, thanks to the effectiveness of a Union blockade. All too often they had to make do with ersatz coffee “brewed from peanuts, potatoes, peas, corn, and rye.” Yikers. The Union, of course, won the Civil War. Just sayin’. But can it kill you? People under 55 who drink an average of more than than four cups of coffee a day raise the risk of dying from all causes, according to a study published in the journal Mayo Clinic Proceedings. Researchers led by Steven Blair at the University of South Carolina found that people aged under 55 who drank more than 28 cups a week saw a 56% increase in death from all causes. According to research published today in the New England Journal of Medicine, people who drank four or five cups of coffee a day tended to live longer than those who drank only a cup or less. The benefit was more pronounced for women, but men also stand to gain somewhat from pounding joe. Coffee-drinking men cut their risk for death by 12 percent after four to five cups of java, according to the study, which was led by the National Institutes of Health’s Neal Freedman. Women who drank the same amount had their the risk of death reduced by 16 percent. I was alerted to Coffitivity by industrial/organizational psychology professor Kathleen Rospenda (Illinois-Chicago), who responded to my recent Facebook post pondering why noises in libraries distract me, while noises in cafes help me stay on task. I don’t know if Kathy discovered the site as part of her scholarly research agenda, but citing her credentials gives this blog piece more street cred. 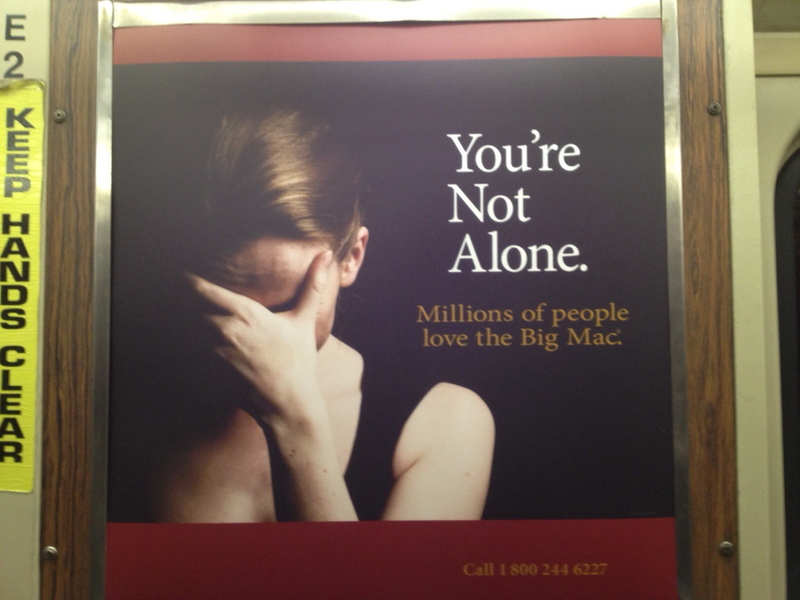 McDonald’s is now pitching Big Macs by making fun of public service ads for people who may need mental health counseling. I don’t think I’m being oversensitive or too “PC” about this. If you ride the subway regularly, you often see public service ads depicting a person in obvious distress, captioned with a few supportive words, and listing a phone number to reach a sympathetic ear. We’re living in difficult times. There are a lot of people who are struggling with their mental and emotional health. They may be highly stressed out, depressed, or even suicidal. The ad writers and executives in McDonald’s high-priced marketing operation missed the boat badly on this one. I’m sorry, but the ad is just too close to the real thing to be funny. At this point I’m a little bemused by how this story has turned mini-viral. Popular Boston blog Universal Hub and Time magazine’s Brad Tuttle also picked up the story, and I had to decline an interview with Boston’s Channel 5 News because I’m out of town. I deliberately tried to write the post in a way that was pointed but non-inflammatory, so it’s quite interesting to see how something like this grows legs. April 11 update: And the Boston Business Journal‘s Galen Moore pulled the story together, including more about the Arnold advertising firm apparently responsible for the snafu. Mental health advocates yesterday blasted a McDonald’s ad on the MBTA that appears at first to be a public service announcement targeting people suffering from depression. I didn’t grow up in a particularly wealthy area, but Northwest Indiana back in the day was home to steel mills that promised a decent paycheck to many a family. Most of the region’s cities and towns straddled the line between “working class” and “middle class.” For many young people, the future included possibilities such as working in the mills, going to a local college, or raising a family. If you’re like me, you grew up thinking that working behind the counter at McDonald’s or Burger King was a classic entry-level job. It was not unusual to walk into a fast food place and to see one of your high school classmates taking orders or working the french fry baskets. And if you had that job or something like it (mine was working as supermarket bagger), you might joke about making the minimum wage but mainly took it in stride. After all, you assumed that better opportunities would come your way. But hold on a minute. 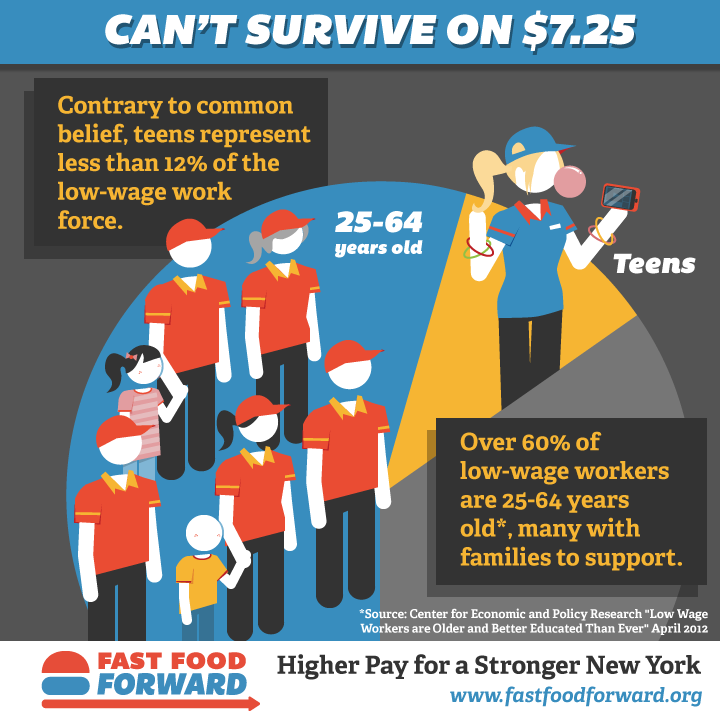 In truth, the vast majority of our low-wage workforce — including most who work in the fast food industry — are adults, and they’re not working behind that counter to pay for weekend movies or nights out with friends. Okay, so maybe your dietary habits have evolved beyond Big Macs and Whoppers. But if you do find yourself ordering at any fast food restaurant, take a look at who is working there. At many of these places, you’ll find a good number of workers who are well past their teen years. It’s their main job (or one of them), and not infrequently they’re trying to support a family on it. Just as there are wage-related reasons why we can walk into a big-box store and buy a DVD player for $40, the low prices of fast food items are partially enabled by the small paychecks of the people preparing and selling what customers consume. I shake my head at people who scoff at the idea of fast food employees and other low-wage workers trying to unionize. These critics regard such organizing as an act of entitlement . . . Hey, I worked for the minimum wage before going to business school/marrying a doctor/winning Lotto . . . Why can’t they? But let’s understand reality: Many people are trying to support themselves and their families in these jobs. And the Barons of the Low-Wage Workforce aren’t giving it up voluntarily. It will take workers organizing on their own behalf to push them beyond McWage-level paychecks. Here’s wishing it happens. I’m taking a break from my usual posts about workplace dysfunction to report news of more significant gravity: Dunkin’ Donuts and CareerBuilder have teamed up on a national survey to identify the occupations with the heaviest coffee drinkers. For all of you whose occupations didn’t make the list, get over it and have another cup or two. I’m a little miffed that neither of my main venues, higher education and law, are on it, but at least this gives me a goal to work toward.